When it reaches the public, tvOS 11.2 —now in beta —will let Apple TV 4K users optionally force the set-top to match the HDR settings of content, and not just default to the fastest available frame rate. In the current tvOS release, Apple prefers frame rate whenever possible to avoid the interface juddering displayed when tvOS runs at 30 hertz, The Verge noted on Tuesday. The policy can create issues with some TV sets —on a TV capable of 60 hertz HDR10 but 30 hertz Dolby Vision, for example, tvOS will default to the former regardless of how it looks. The change in tvOS 11.2 was discovered in a developer video on Apple's website. 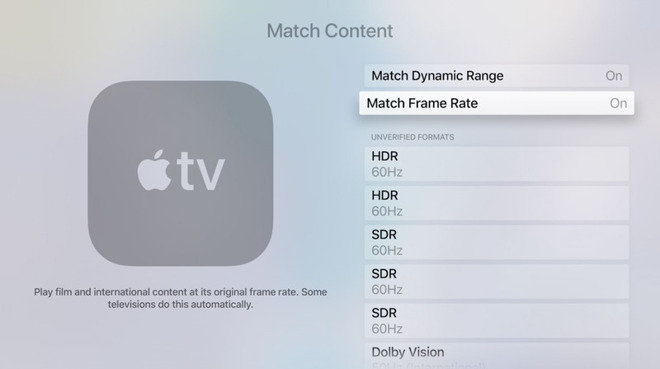 People will be able to go into the Video and Audio menu within the Settings app, select "Match Content," then toggle "Match Dynamic Range" and/or "Match Frame Rate" on and off. The first developer beta of tvOS 11.2 was released on Monday. Included are APIs for automatic frame rate and dynamic range switching for apps that don't use AVKit for video playback. It's not certain when the finished update will become available, but Apple typically takes several weeks for bigger point releases.